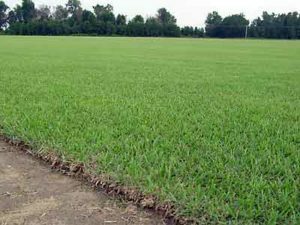 Its beauty and functionality make Empire grass uniquely suited for homeowners and golf courses in varying climatic conditions throughout the southeast. On golf courses, Empire grass’s unique texture and dark green color offers a striking contrast to other grasses and highlights key features such as bunker faces, mounding, and roughs. For homeowners, Empire Zoysia is an eye catching, durable grass that provides a superior alternative to centipede or Tall Fescue. Of particular interest to homeowners is the ease with which this grass can be grown. Empire grass has excellent fall color retention yet exhibits a beautiful, golden brown color during the winter months. 1. Low maintenance lawn – nicknamed “EZ” lawn. It grows slower, needing only to be cut every 7-14 days. Maintain between 1-2″ (1″ is optimal). Heights above 2″ will reduce quality. Cut with a sharp blade standard rotary mower. Never cut more than 1/3 of the total length of the blade. EMPIRE Zoysia prefers a mower that bags the clippings. 2. Due to its deep massive root system EMPIRE Zoysia can survive on one third of the water that St. Augustine does, which is a major plus, because Tampa municipality has frequently restricted watering – currently it’s once a week. 3. EMPIRE Zoysia has rapid injury recovery after drought. 4. EMPIRE Zoysia was discovered in hot humid Brazil. It does well in heat and humidity. 5. EMPIRE Zoysia is weed resistant due to it’s tight mat and strong, thick, deep root structure that has a reputation to stand up to invading grasses and weeds. It’s called EMPIRE because of its dominance. 6. EMPIRE Zoysia is ideal for kids to romp and play ball on. It’s planted in parks for its excellent wear tolerance, eye catching dark green color and soft-to-the-touch feel. 7. EMPIRE Zoysia looks like a beautiful lush soft inviting carpet that will greatly enhance the beauty of one’s home. 8. EMPIRE Zoysia is susceptible to billbugs which are easy to detect and treat with Sevin from Wal-Mart.